The United Nations finally concluded its Climate Change meeting in Durban, South Africa at about 3:30 a.m. Sunday, a day and a half late. Delegates did not create a new treaty to legally bind nations to limit greenhouse gas emissions to replace the 1997 Kyoto Protocol. Nor did they approve a global tax scheme to fill the Green Climate fund. Nonetheless, developing (poor) nations, called G-77+China, took home the spoils because some developed (rich) nations voluntarily extended their commitments to the Kyoto Protocol and voluntarily granted start-up funds to the Green Climate Fund. The final Durban Platform produced by the 194-party conference created a new Ad Hoc Working Group on the Durban Platform for Enhanced Action to begin work immediately on a new treaty to replace the Kyoto Protocol which will supposedly put all countries under the same legal regime enforcing commitments to limit greenhouse gases. It is to be presented for approval by 2015 and to take effect by 2020 at the latest. The G-77+China negotiated forcefully to continue the Kyoto Protocol so that they can continue to profit from mostly European nations (the U.S. Senate has not ratified the KP) that offset their greenhouse gas emissions by moving industries to developing nations, primarily to India and China. India led the G-77+China efforts calling “equity” the “centerpiece of the climate change debate." Jayanthi Natarajan, the Indian minister of environment and forests, added that her country would "never be intimidated by threats”, expressing her disapproval of the notion that ALL nations be part of a new binding treaty. Even language calling for “a protocol, another legal instrument, or a legal outcome” was replaced with, “an agreed outcome with legal force,” to accommodate the G-77+China. The G-77+China also fought for and won funding for the Green Climate Fund, established at last year’s meeting along with a 40-member Transitional Committee that was to design a global tax scheme to fill the GCF. 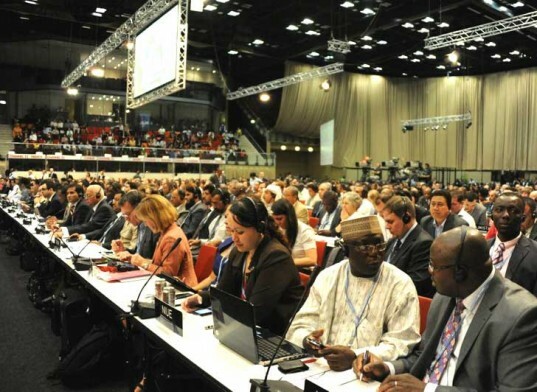 Durban delegates, however, stopped short of approving a tax scheme; instead, they created a 20-member Standing Committee composed of equal numbers of representatives from developed and developing countries to overview and assist those who meet annually at the Climate Change meetings. Developing countries are to begin accessing the GCF in 2012. The World Bank has oversight of the GCF for three years, but the new Standing Committee will become the intermediary between the COP and the World Bank to assuage the angst of environmental extremists who do not trust the World Bank because it has financed coal-fired power plants in developing countries, which they consider wholly unacceptable. A work program on long-term finance was also created to analyze options for more resources from a variety of sources to meet future escalating demands for the GCF. The global economic crisis worked in the favor of most Americans who oppose new taxes, global or otherwise. Americans who support free markets and clean dependable energy, and oppose the economically destructive and environmentally ineffective legally binding greenhouse gas emissions limits, won a temporary stay on a new treaty and a new global tax. We will see what happens at Rio+20 next June and in Qatar next December.